Review and post minutes of the previous safety committee meeting. Review incidents of injuries, accidents or near misses. Review of any workplace safety concerns, training, or inspections. 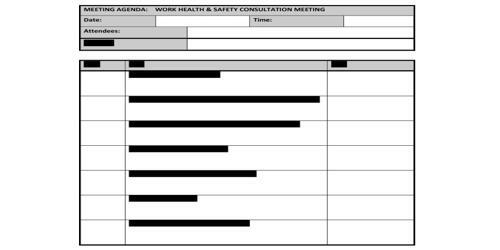 Review of workplace safety accomplishments if any. Health and safety topic discussions: machine guarding safety. Health and safety topics: recommended changes or suggestions. Handing out minutes of the disaster Council meeting held on [date of the meeting]. Presentation by [name of the individual] from the Berkeley Police Department. Appointment of a subcommittee to work with the planning department on seismic retrofit standards. Annual elections of chair and vice chair.